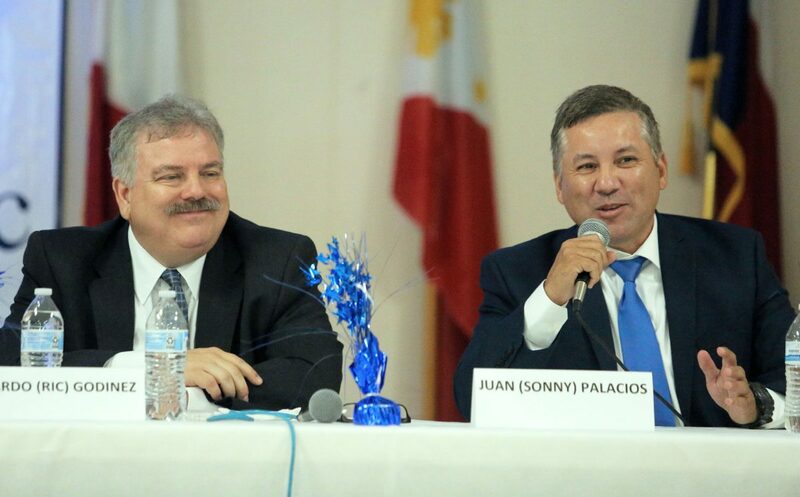 Candidates Ricardo Godinez, left, and Juan Palacios answer questions as they vie for the Democratic Party nomination for the 93rd District Court judge during a forum held at the Nomad Shrine Club on Saturday, June 16, 2018 in Pharr. PHARR — Several dozen Hidalgo County Democratic Party precinct chairs attentively listened to four district judge candidates, whose elevator pitches seemed to mirror each other’s, during a forum Saturday at the Nomad Shrine Club. In less than two weeks, 69 elected precinct chairs — some of whom were not in attendance at the only forum the party held to inform them of candidates’ stances — will be tasked with choosing the Democratic nominee for the 93rd state District Court. Some chairs have been here before, having selected a sheriff nominee following the resignation of then-Hidalgo County Sheriff Guadalupe “Lupe” Treviño who pleaded guilty to money laundering in 2014. Less than four years later, they are in similar spot — again undertaking the somewhat uncommon process of choosing a party nominee to potentially face a Republican in November. This time, though, they are navigating the selection of a judge nominee following the resignation of former District Judge Rodolfo “Rudy” Delgado, who the FBI arrested in February on bribery charges. Many of those seeking to potentially spend a career presiding over the 93rd state District Court said they want to restore trust in the courtroom clouded by the raid that took place there only four months ago. A majority of precinct chairs on Saturday wore campaign T-shirts and political buttons supporting either former District Judge Fernando Mancias, attorney Teodulo “Ted” Lopez, former Hidalgo County Democratic Party Chairman Ricardo “Ric” Godinez or current Edinburg school board member Juan “Sonny” Palacios Jr. — the four attorneys seeking the judgeship. Some chairs, though, still remain undecided. The candidates mostly echoed each other in their responses to the same questions posed to all of them, including potentially calling on the Texas Legislature to allow for the establishment of more district courts in an effort to alleviate courtrooms overburdened by hefty caseloads. With the role of precinct chairs in mind, they often spoke not only about their potential duty as a judge, but also their commitment to get out the vote for the party in November. Most of the differences, though slight, came when the four made their closing remarks. Godinez said the “perception of whether or not the court is fair” needs to be improved, noting that he has seen the courthouse raided six times in his 25 years as an attorney. “It’s not just the length of years or the amount of gray hair you have, it’s the breadth of that experience,” he said. In 2016, Godinez and Palacios were part of a team of lawyers representing six Donna school district employees who were awarded a settlement in a federal political retaliation lawsuit against the district. He said he took the case on despite a risk of losing his re-election bid for party chairman. “You may not have agreed with me on everything, but at least I’ve demonstrated to you that I have that courage, that I’m willing to make those hard decisions,” Godinez told precinct chairs, most of whom he led as party chairman from 2014 through last week. Calling himself a progressive, Palacios also focused on rehabilitation after conviction. “We want to make sure that everybody has a chance to get a second chance, to get a third chance, that there are no hopeless causes,” he said. A member of a powerful political family in the county, Palacios acknowledged some of the criticism that comes with the name. “People tell me, ‘You know Sonny, the best part about you is that you’re Sonny. The part that’s hard for you is that you’re Palacios,’ and I take that as a blessing,” he said, clarifying that while his family doesn’t always agree, they respect each other at the end of the day. He also brought up the case against former Donna ISD board members and said he is committed to helping anyone who may be disenfranchised. Mancias, a retired district court judge, often mentioned his experience presiding over a courtroom for 12 years. “If you want somebody that’s been involved in the community for many, many years, in all different ways, and especially in issues that involve the Democratic principles, Fernando Mancias is your choice,” he told precinct chairs, noting that he was already considering a run for the judgeship even before Delgado’s resignation. He vowed to continue lobbying for “more money for indigent defense,” an issue he said he dealt with in the past. Mancias said he previously worked to keep courtrooms open when in 1996 “people who had agendas” attempted to shut them down. Mancias, though, did not go as far as naming them. “It’s important to lobby for these issues that affect individuals, and affect the court system, and affect all of us taxpayers,” he said. Unlike Mancias, Lopez is seeking public office for the first time, but still considers himself a public servant, having worked as an assistant district attorney, and he lauded his political newcomer status as a way to woo precinct chairs. Lopez, an attorney who has his own law firm, said “in light of recent events,” he felt a need to toss his hat in the ring. If elected, he said he would improve the use of technology in the courtroom, establish an expungement program for those who had their cases dismissed but could not afford a case expungement and wants to be involved in veterans court. Out of the 69 precinct chairs, 42 attended the forum, according to Hidalgo County Democratic Party Chairwoman Norma Ramirez. Families of candidates were also in attendance, and supporters of Lopez served tamales while a precinct chair supporting Godinez sought signed endorsements. Precinct 127 Chairwoman Rose Marie Alaniz and Precinct 176 Chairman Albert Rodriguez, who were not precinct chairs when the party selected a sheriff nominee, said they are still mulling over the qualifications and experience of the candidates. “I want to take my time (in deciding),” said Alaniz. The two Alamo residents, though, said they would consider a candidate they aren’t completely familiar with but have gotten to know through the process. On Monday, the Hidalgo County Democratic Party’s executive committee will finalize the procedure in which chairs will select their nominee. During the 2014 selection of a sheriff nominee, the party opted for a roll call vote, in which precinct chairs verbally and publicly announced their pick. This time around, the committee could consider a secret ballot. Precinct chairs will vote on Friday, June 29, for one of four candidates. A runoff is likely since candidates must secure 50 percent of the precinct chairs’ votes plus one.